VITASTACK is your nutrient foundation. Bodybuilders and athletes hit the gym hard. You demand far more from your body than anyone else. You want to be better than you are today. You drive yourself through complete dedication and, your nutrient demands far exceed the norm. Too many of the best intentioned, hardest training athletes fail because they demand more from their body than they put back. Over time, excessive demand and often unintentionally limited diets can create nutrient deficiencies that side-line even the best bodybuilder, athlete or competitor. While the effect can vary widely, the result is too often the same. The training and the progress grind to a halt. Who may benefit from Vitastack™? 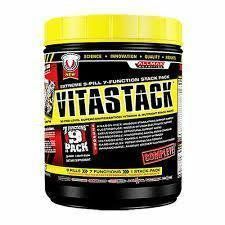 VITASTACK™ is COMPLETE; it gives you nearly everything you need for performance recovery and growth. * It provides the foundation for intense training. * In the gym, bodybuilders and athletes place extreme demands on their bodies. As a "self-defined" extreme user, those who want to categorize themselves as having "extreme" needs may buy into this concept. ENERGOFORCE is designed to support the most important of all organs, the brain. * Designed to memory and focus, ENERGOFORCE promotes the kind of alertness and focus required for ongoing intense training. * Key nutrients work to sharpen the mind and keep you in the game. * A dull or worn down mental function can quickly lead to a lack of enthusiasm to keep up with your training. Staying focused and mentally prepared will keep you on track and gaining in the gym. CARDIOPULSE is a truly complete OMEGA 3-6-9 Essential Fatty Acid blend that delivers 212 mg ALA, 120 mg DHA and 80 mg EPA in a single RapidSorb Softgel Capsule along with other Omega EFAs and Vitamin E. CARDIOPULSE also has pure Flaxseed and Borage Oils to round out this full and complete spectrum of Omega 3, 6 and 9 Essential Fatty Acids. The value of OmegaEFAs cannot be understated. There are literally hundreds of studies suggesting an extremely broad range of reasons why people in general need Omega3-6-9 EFAs and as an athlete, even more so. * Studies on the dietary habit of North Americans suggest that OmegaEFAs are grossly deficient in every segment of society. * And they are called "ESSENTIAL" for a reason, your body does not make them - they must come from your diet. IMMUNOCHARGE delivers an extremely broad spectrum of key nutrients that range from antioxidants to adaptogens with two main goals; to promote immune system functioning and staving off free-radical damage. * This is critical to staying on target with your training. With 530% RDI of two forms of buffered and regular Vitamin C and a complete, broad-spectrum range of all 8 Vitamin E Isomers providing 720% RDI. To compliment this powerful dose of Vitamin C, we've added yet another form of unique Vitamin C in SKELETOCORE, Sodium Acsorbate, another buffered form, bringing the total Vitamin C up to 680% RDI. 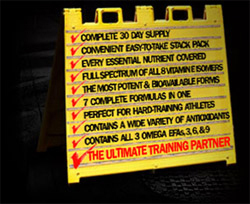 The #1 selling training pak in the world for over 25 years straight. Since 1983, more competitive bodybuilders have cut their teeth on the Animal Pak than any other bodybuilding supplement in history. Why? Simple. Animal Pak gets the job done. It works. First time. Last time. Every time. Nature, in all her ingenuity, has designed the human body as the ultimate performance machine. Fact is, since the dawn of mankind, our bodies have changed very little. When it comes to feeding our muscles, we still need the nutrients we get from our diets. But when it comes time to grow our muscles in a freakish way, we need the right combination and mega-doses of essential amino acids, carbs, vitamins, minerals and antioxidants. Only Animal Pak has what you need. You?re the kind of primal beast who trains with Animal intensity. You need plenty of the above, plus that little something extra only Animal Pak provides. That?s why we?ve also loaded the Animal Pak with performance optimizers such as PAK, CoQ10, lipotropics, L-arginine, eleuthero, and the like. In every pak, you?re blasted with a dizzying array of over 60 key ingredients which are delivered in the right amounts at the right time, every time. Each of the 11 tablets included in each pak has been specifically formulated to deliver the goods. By taking the Animal Pak, you prevent the formation of nutritional gaps. Why should you care? The greater your training intensity, the faster and larger these gaps grow over time. When this happens you eventually hit a plateau. You stop growing. Maybe you?ve already hit this wall. To make matters worse, if you take other supplements, these same gaps begin to render those expensive supplements useless. Many of today?s supplements rely on enzymes and other substances in your body to ?activate? them. Nutrititional gaps mean these key activators may not function at all, so you may be wasting all of your hard-earned money on supplements that won?t or can?t work. Consider the Animal Pak as the cast iron skillet of your supplement program, your body?s first line of defense. 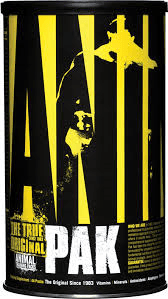 If you train with weights, then you absolutely need to train with the Animal Pak. Remember, while most supplements have come and gone, precious few have stood the test of time. When you?re ready for the best, step up to the most trusted name in serious bodybuilding nutrition: Animal Pak. Dicalcium Phosphate, Whey Protein Concentrate (Milk), Microcrystalline Cellulose, Glucose Polymers, Arginine A-Ketoglutarate, Stearic Acid, Magnesium Stearate, Calcium Carbonate, D-Calcium Pantothenate, Silicon Dioxide, Fumarate, Calcium Citrate, Alfalfa, Rose Hips, Rice Bran, Parsley, Burdock. 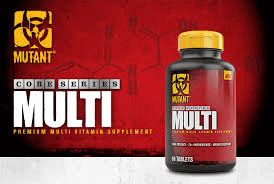 MUTANT MULTI is a complete nutrition insurance formula, harnessing 80+ ingredients into multiple systems, specifically formulated for the harsh realities of heavy lifting. High Potency Vitamins; Minerals including Electrolytes; Phytonutrients; Botanical Extracts; Antioxidants; Enzymes; Berries & Greens; Lipotropic Factors; and ALL delivered in easy to swallow tablets. Start each day with a good meal plus your MUTANT MULTIs and you’re on your way! Everything An Athlete Needs To Function Optimally! 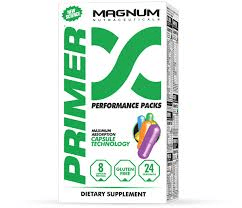 Magnum Primer Performance Packs provide an athlete with the essential foundation required to properly nourish the body. Primer contains high quality, pharmaceutical grade ingredients that are highly absorbable to maximize your cells function and performance. Primer Performance Packs are formulated to support muscle mass and recovery, strength and performance, and fat metabolism. Take 1 pack with breakfast. Do not consume more than 2 packs per day. Magnum Nutraceuticals is dedicated to integrity… the brand to trust. The Magnum Research & Development Team has created products that work synergistically to enhance results. 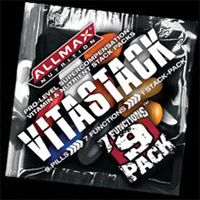 World’s Highest-Quality & Most Complete Multi-Nutrient Pack Ever Developed! 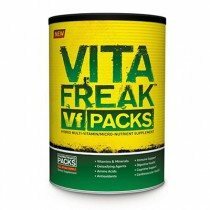 VITA FREAK ™ PACKS are engineered to provide your body with the absolute highest-quality vitamins, minerals and micronutrients available! If you expect your body to have superior-quality health, then you need to provide it with superior- quality nutrients. VITA FREAK’s gold-standard formula is designed to optimize every aspect of health and prime your body for greater performance, muscle growth, strength and recovery!